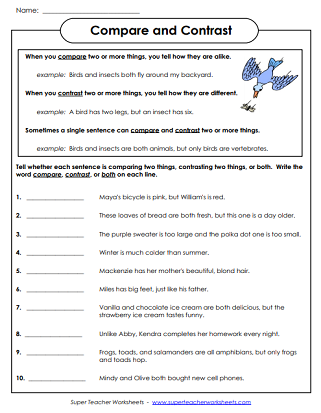 This page contains a large collection of compare and contrast graphic organizers, articles, activities, and worksheets. This version of the Venn diagram has lines for students to write on. This Venn diagram has three circles for comparing/contrasting three different topics. Are you tired of using Venns for compare and contrast? Try the double bubble map instead! Read the compare and contrast article about dolphins and porpoises. This article incudes a question page, a graphic organizer, and a vocabulary worksheet. This article highlights the similarities and difference between boas and pythons. After reading the article, students answer the comprehension questions and complete the Venn diagram. 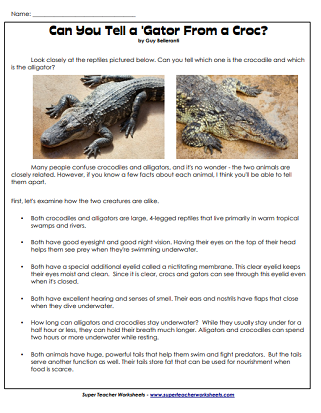 This non-fiction passage explains the differences between alligators and crocodiles. Several comprehension questions follow the article. How can you tell the difference between frogs and toads? Students will find out when they read this fascinating animal article. 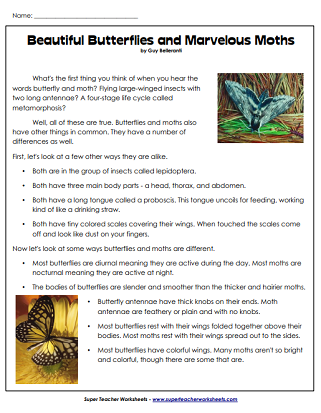 Learn about the similarities and differences between moths and butterflies. A page of comprehension questions are included. This cute story describes two people: Tall Mary and Short Harry. Compare and contrast the two characters, then answer the questions that follow. Compare two delicious, tropical, yellow fruits: bananas and pineapples. Read the passage and then answer four comprehension questions. Would you rather visit the beach or climb a mountain? These two paragraphs highlight the similarities and differences. Students read a book and movie with the same title. Then they compare and contrast the two. This project includes short answer questions, essay questions, and a Venn diagram. Compare and contrast the two creatures shown. This version has primary-ruled lines for students in grades K through 2. Compare and contrast the two creatures shown. Use a Venn diagram, then write a written comparison. This version has intermediate-ruled lines for students in grades 3 through 5. Color the creatures, then compare and contrast them. This version was written specially for younger students in grades K through 2. Color the creatures, then compare them on the graphic organizer. After that, use the information on the organizer to write a written comparison. This version was created for students in grades 3 through 5. Color, compare, and contrast. This worksheet is recommended for students in Kindergarten through 2nd grade. Color the unusual creatures in the illustration. Then compare and contrast them on a graphic organizer and in essay form. Recommended for students in grades 3 through 5. Read each sentence and tell if it's making a comparison between two things, if it's contrasting two things, or both. S.T.W. also has worksheets for teaching students about main idea in reading and writing. Download writing webs, t-charts, concept wheels, and more. We have hundreds of reading comprehension worksheets for all elementary grade levels. This page has a series of Venn diagrams for teaching math concepts.